As you can see, having a busy one year old has slowed down our progress. Not only that, but we are a bit wearisome of plastering. So, we are moving on to other things, smaller tidbits and outside work now that the weather is getting really nice. 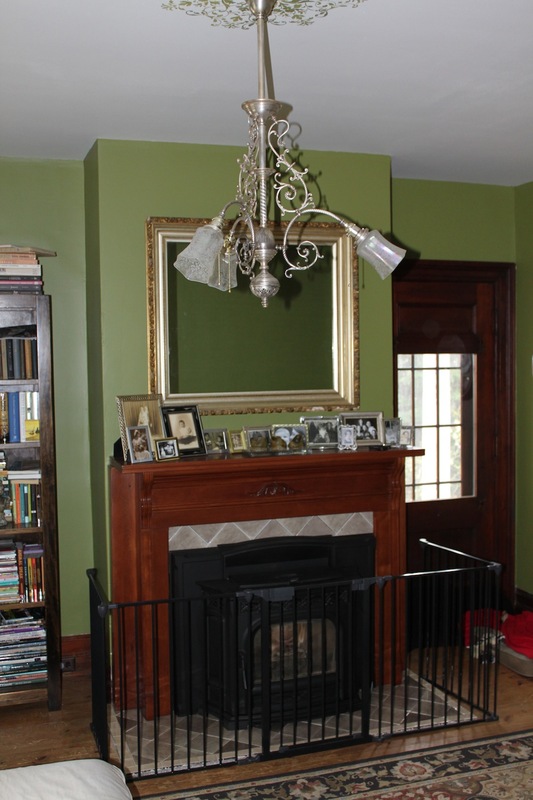 We finished up the light fixture and fireplace in the living room. Bill had to rewire the light from its original 1890’s work and we polished it nicely. I stenciled the ceiling and we hooked it up. Next, Bill fitted cherry moulding onto the mantel to fit it around the pellet stove and put it into place. All complete, whew. The only thing needed now in there is floor refinishing. We are looking into hiring someone to do the floors. Not that we don’t want to do it ourselves, but we want it done really well and rather quickly with a little one. It will be easiest to have them completed while we are on our winter vacation in December. So, we’ll see. I mentioned above that we have been aching to get to some outside work. The past three summers at this house has seen us weeding, mowing, pruning and clipping desperately to get back to some sort of semblance of “trim”. With over 15 years of almost no yard work outside, we’ve had a lot to combat. 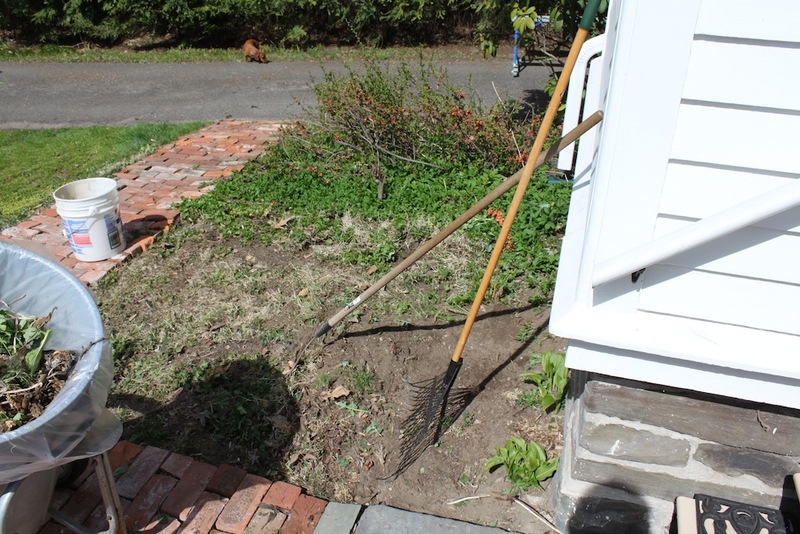 This weekend, we started really digging into a flowerbed. As this is the fourth summer we have lived at 60 West Main, we really want to plant a few things permanently, and I have been dying to have berries. I love the idea of an edible, renewable garden, that attracts bees and butterflies. 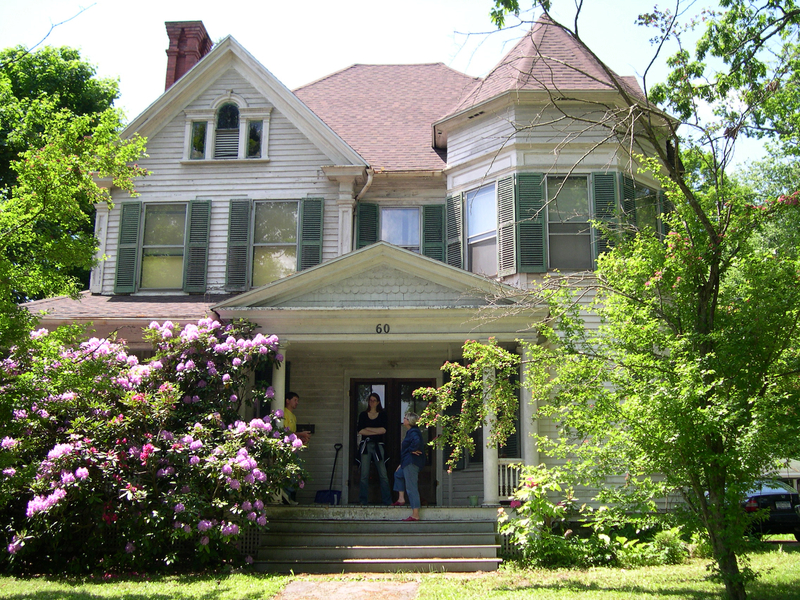 Though I know little of gardening, I am starting somewhere to make this house beautiful on the outside and easier to maintain. I started on a bed in the backyard, as it gets a lot of sun and I think it makes the most sense for edible plants. Though the front yard needs work, too, I just needed to work somewhere that I walk past regularly. And, I like to sit on the back porch in the evenings with Bill. The whole yard will one day be a lovely garden, I’m sure. Once the baby is up and ready, he will be outside with us, in a sandbox or pool, or digging for worms. I look forward to doing that all together. But honestly, a weekend with Bill in the yard was just what I needed. You can see here how much we had to weed and de-rock. And, there were a few wires to pull. One wire goes under the entire yard to electrify the garage. The other wire dead ended somewhere, but we believe it had originally lit a small raised bed that we pulled out at the beginning of the first summer. I have a lot of weeds to pull out to complete this bed and a Japanese quince to trim, but I’m looking forward to planting raspberries and lavender here. Possibly some flox and some bulbs of some sort, too. We’ve been building a great compost pile for the past 2 years, so I’ll have some natural fertilizer. Now the task will be to keep Heidi from digging. Next on our list is to refinish some indoor furniture pieces and complete a set of bookshelves. Really, the books are the only things standing in our way of putting a floor in the servants’ stair closet. I’ll fill you in more on that project down the road.